What is painted on your ceiling? Does God let go of people? Does hell exists? Is there eternal punishment next to eternal life? A Christian cannot avoid these questions; too many is said about this in the Bible. But how do you answer them? And what do you do next? When we were on holiday in Florence one time, we visited a cathedral, the Duomo. Over different stairs you can climb all the way up and enjoy the view on the Italian city. Along the way you pass the dome of the cathedral. 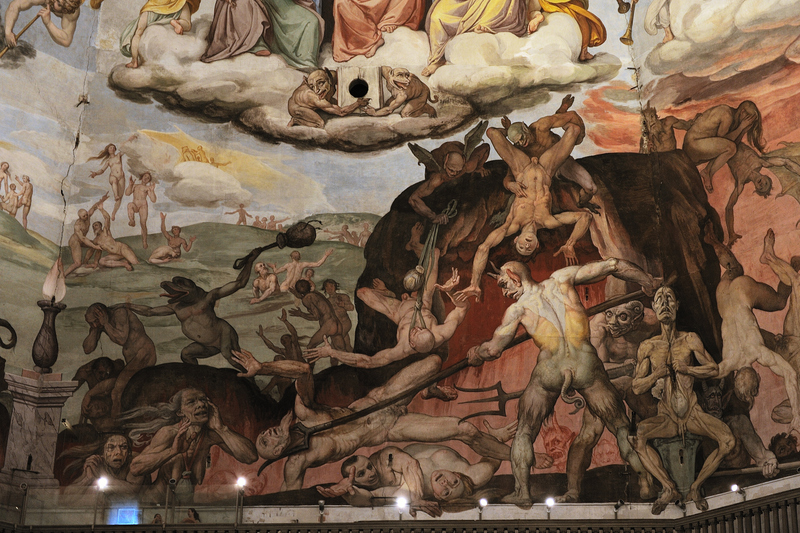 Besides beautiful images you can also see horrible scenes which depict the last judgment and the associated punishments. From the ground level these scenes already look impressive, but if you walk past it very close, they have even more impact. The various reactions of visitors were surprising. On one it made so much impression that he almost did not dare to walk past it. I saw a mother carrying a child past it, turning away its face from the scenes. Other people pointed at the scenes laughing, like it was a hilarious comic book. These questions also determine your view on God’s identity. Does God reject people? Does Jesus send people to hell? That often is a view that does not correspond to the image people have of God and Jesus. 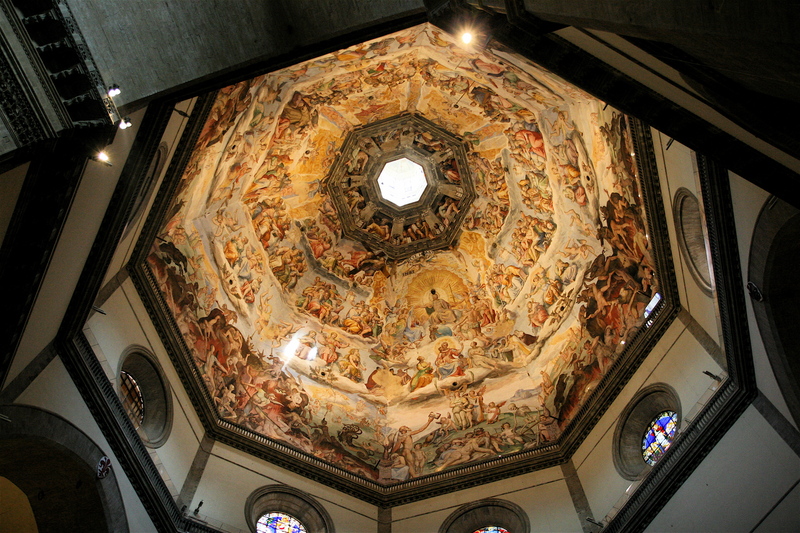 You can react to all these questions as the tourists in Florence when they see the paintings in the dome of the Duomo. One person hardly has the courage to think about it. The other views these as questions that were asked in the past, but they are not relevant nowadays. Duomo: detail. Picture Rudy Kaptein. A lot is said about eternal life and hell in the Bible. Therefore, a Christian cannot simply avoid these questions. Besides that, there are two important reasons why it is good to further discuss this topic. First, among orthodox Christians the way to deal with religious contents of eternal punishment and hell is changing from the way the church has dealt with these topics in the past. Recently, various publications have been released, like Love wins of Rob Bell (2011), The one purpose of God of Jan de Bonda (1998), and Unapologetic of Francis Spufford (2012). How different these book might be, they share the belief that God’s love for people provides space to ask questions regarding the idea of an eternal punishment or, for a while, to simply discard the existence of hell (Spufford). Another reason is the feeling that is nowadays present in our society. In Northwestern Europe since 1960, society has become detached from the influence of church, and self-development has a central role. Trendwatchers have once said about the relation to eternity: ‘The attention for hell disappeared together with the attention for heaven. After death, there is no reward, nor punishment.’ Our focus on ourselves is limited to what we experience here and now. Although attention for heaven seems hot again, it does not relate to God but to angels and our own continued existence. More important than to complain about the current mindset, is to acknowledge that we, as Christians are fully part of this time. Look for example at topics that are suggested for themed church services. Topics are durability, being missionary, the place of children in church, being Christian at work, liturgy, disabled people, etc. All important topics. But I never got a request for a themed church service on hell or predestination. And if it is the topic, the service is announced as a ‘special service’, with a ‘hot item’. To stick to the image of the Duomo: I think that our society does not even ‘see’ the topic and that Christians look at it, mostly from a distance, from the ground floor. It becomes really interesting when you combine the above-mentioned developments. It is often pointed out that it is more than coincidental that precisely in this time all kind of Christian books are published with different opinions about hell. That is definitely an important point. It means that besides showing respect to these pleas, we should also continue to be critical. I will come back to that. At the same time, we also cannot leave it at that. It is at least equally important to turn around this question, towards ourselves: how does God speak to us regarding this topic? First, it strikes me that when we think about eternal saving, it often concerns others. The question is whether people that are not Christian will really be lost forever. That is an approach often inspired by pastoral motifs. But why isn’t it as much about yourself, about you as a Christian? Or are Christians already ‘in’? In the book of Matthew it is remarkable that Jesus rejects people who have acknowledged Him as Lord (Matthew 7:21 and following). The impressive parable about the sheep and the goats does not say that Jesus’ followers will make it because they are Christian (Matthew 25:31 and following). The people that are welcome are the ones that have served Jesus by actually caring for the insignificant ones. And when Jesus is asked whether only few people will be saved, He says that you should try your best to go in through the narrow door (Luke 13:23 and following). An unhealthy fear is never aroused with this in the Bible. That does not fit in the loving relationship with the Lord. John expresses this wonderful: love makes sure that you will not fear at the day of judgment (1 John 4:17-18). Exactly that statement stands out in the context of this article. Love and judgment appear in the same sentence: apparently they do not exclude each other. Moreover they are being expressed in the context of the Christian congregation. These texts let us feel that we have a relationship of love with the Lord. He judges with reward and punishment, in His way. Why don’t we let Him judge other people (1 Corinthians 5:13)? What fits us is modesty. It is our task to grow diligently in faith and love through the Spirit. What also surprises me, is that often an unconnected way of speaking takes place in pleas questioning hell. For example, Unapologetic of Spufford. I think that is an interesting book. In a welcoming way the author puts faith in the framework of a society which has no room for God. But in his way of talking about hell it seems that Spufford has an axe to grind. He undermines simplistic Christian imaginations about judgment and punishment and says that hell makes a torturer out of God. He claims that hell is an ancient misunderstanding among Christians who do not account for Gods mercy for all people, but who want justice for offenses that have been done. In a few pages more essential topics are being discussed. Sometimes it might help to shake up old mindsets. That is how I read this part. Spufford is right that we should not believe medieval illustrations about hell. Thinkers like C.S. Lewis picture hell as a place where you are fully handed over to yourself and meaninglessness, a life without God. But subsequently Spufford makes himself implausible. Just before his part about hell he writes an impressive part about Jesus. But no one in the Bible speaks as much about hell as Jesus. Spufford does not mention this. In his opinion, by doing that, Jesus would possibly become an accomplice of ‘the torturer’. In the same way, Spufford talks about justice. He repeatedly mentions human preferences. However, the Bible shows how love and justice go hand in hand with God. That is how we know God in Jesus (Romans 3:25-26). In this article there is not much space to discuss this in detail. But more arguments where a plea is made for another opinion on hell often do not show much connectedness. Against an idea like ‘God proves the magnitude of his love, by not letting go of anyone’, you can put equally strong: ‘God proves insignificance by letting go of no one’. The love of God becomes empty, meaningless if everyone will be fine. And in some arguments the word ‘eternal’ is used in a strange way. The argument is that eternal punishment will be present for an indeterminate period, but it is still time. And time will end one day. This way room is provided to see hell as a temporary punishment. This is also hardly connected. Because if it is about eternal life, this really is timeless. In both cases it is about the word eternal. Some say this is destruction of language. That is put strongly, but it does point towards the conflict. I think the heart of this topic is that it is impossible for us to make a system of the way by which God does justice and his mercy. But we know Christ and in Him, Gods incomparable surrender of Himself and Gods impossible, life-threatening calls are combined (Matthew 16:24). In this way, only through Jesus, God gives hope to this world. Also with regard to profound topics like in this article. With regard to this, people have pointed to the special aspect of the reformed teaching on predestination. That gives hope: because God knows his followers he will give them salvation in Jesus. Not human faith or devotion or the complete opposite of that is decisive: only Gods mercy through Jesus. We may expect everything from that. The time that we live in especially makes an appeal to this mercy. Because where today’s society takes its distance from hell, society is confronted with the hard and excruciating reality of today. I think about the violence by IS. At not that much distance from the cathedral of Florence with her images about hell, this terrorist organization shocks the world with its brutal actions. What we experience as the middle ages when we see a painting in a cathedral, happens today, just around the corner. It is shocking that this movement attracts followers nearby, among young people in our society, in our cities. The most well-known executioner, ‘Jihadi John’, most likely was living in London. More and more, religious and non-religious people come to see that this organization has a deeply religious character (the Atlantic, febr. 2015). IS wants to unleash an apocalyptic war, so that the end of time begins, and the Mahdi, some kind of Islamic messiah, will come. We need to have an eye for the spiritual war that is going on behind all this violence. Western countries are mostly in despair, but Christians have a real weapon in this war. Namely, prayer that God will touch their hearts and will convert them, so that they can receive mercy. Christians look beyond the executioners and the hate. Besides praying for their victims, we can also pray for the terrorists and appeal to God for forgiveness in Jesus. That prayer only finds true reason and power in Him. Besides that, we cannot withhold from this organization and its followers the Biblical word that indeed a promised one will come: Jesus. And we shall have to tell the shocking news that this God will send people to hell who did not obey the law and did wrong. No one else will do this. It is a pervasive call to convert. It is better to point everyone to the clear biblical word about the coming of a savior and judge Jesus than to discuss topics on which we are not sure. He judges. And if that verdict is too tough for us, let the church act like the mother in the Duome. She carried her child past the paintings. That is how we help each other on the way towards the perfection of Gods kingdom. This entry was posted in Bijbelstudies, Cultuur, English and tagged Does hell exists, eternal punishment christianity, IS Jesus, Jesus hell by Matthijs Haak. Bookmark the permalink.